NEO is a project that I have had high interest in this past year, both due to the potential governmental and industry applications, as well as the value of holding NEO tokens to receive GAS payouts. 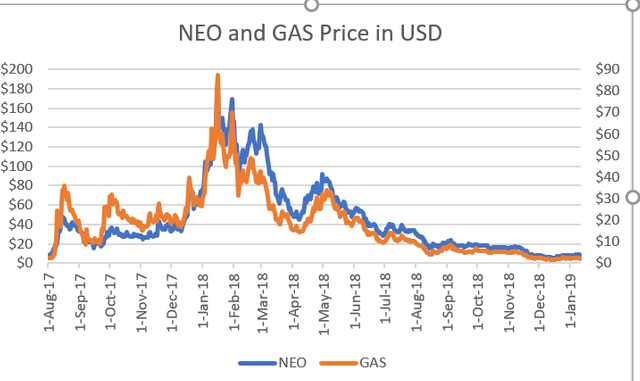 As I have been following NEO, one trend kept recurring that I wanted to further dig into: the price movement of NEO and GAS routinely tracked one another, yet GAS regularly outperformed NEO in gains during temporary run-ups. I started to recognize that if there were a way to validate this and understand when GAS would outperform, it opened up ab opportunity to grow my NEO holdings faster than accumulating GAS and compounding by exchanging those rewards for NEO. Let’s dive into each of these key areas and explore the viability and value of an approach like this. The above chart uses opening prices from CoinMarketCap to plot the movement of both tokens over time. What is very appealing about this trend is that it means that both NEO and GAS regularly move in the same direction by a similar magnitude. This means that you can be in either or both of NEO and GAS and enjoy similar upside gain and downside risk over time. If you compare this with other trading strategies where you attempt to move between Bitcoin and Tether, or an Altcoin and Bitcoin, if you move too early or too late, the coin prices can diverge so greatly that you eat into your potential gains or incur losses. With the above trend, if you end up in the lower performing token during a bull or bear cycle, as long as you do not panic and wait it out, the tokens routinely mirror each other over time. If you zero in on the bull and bear cycles within this time period, you will see that while they normalize over time, GAS routinely outperforms NEO in terms of percentage increase and decrease during these cycles. Out of four bullish cycles, GAS outperformed NEO in percent of overall return three out of four times. Out of four bearish cycles, GAS had a greater percentage loss of value in all four cycles. Out of eight overall cycles, GAS percentage movement to the positive or the negative exceeded NEO seven out of eight times. As long as this trend holds true going forwards, it opens up trading strategies for those who are hodlers of NEO, that can generate greater returns than just hodling NEO for GAS. If you look at current GAS rewards at https://neotogas.com/, you would expect to receive about 4 GAS per year for every 100 NEO you have, which at current prices is about 1-2 additional NEO per year. If you instead take advantage of short-term divergence in price between the two tokens, you can generate greater gains than this every time you pivot between the two. For example, with those same 100 NEO tokens, you could exchange them for about 350 GAS. When the GAS:NEO exchange rate increases by 5%, you could then exchange back to NEO and end up with about 103 NEO. That sort of a simple movement can occur quite frequently, and if you execute this even once per month, you can end the year with over 130 NEO compared to 102 by hodling for GAS. Whenever you feel that NEO is oversold/undervalued, and expect that there is a chance for a run-up in the near term, then buy into GAS. You can do this all at once, or if you want to gradually trade NEO for GAS as the NEO price falls (for example at every 10% reduction in the price of NEO, trade 25% of your holdings for GAS). Whenever the market turns and these tokens start to rise, you can either let the market run and try to time it as it turns, or similarly sell back a portion to NEO every time it moves up 10% or 20%. The goal with this is to capture additional gain from being in GAS during the run-ups, while being back into NEO during the majority of the next drop. If you feel that we are neither near a big increase nor a big drop, then use limit orders to capture small gains when the market moves sideways. If you have GAS and it is currently trading at .28 per NEO, then set a limit order around .30, which means a 7% gain when it occurs. Once it reaches the .30, then set a limit order to buy back to GAS at .30. In the past 5 months, there were 7 times your limit order would have triggered, just looking at opening prices on CoinMarketCap. If you consider that the price also fluctuates during the day, this likely occurred much more frequently than 7 times. If you take this approach, you need to be mindful that the price will frequently keep moving once it hits your limit, and you just need to wait it out again until it re-enters your window, or use wider trading bands, or multiple trading bands (such as exchanging 25% at a time, over four different 5% windows of price movement). If you take this latter approach, at any given point, you will have 4 different limit orders open, and it is very common to have both buys and sells open. Every time one order is executed, you then open a new one at an additional 5% gain over what you just acquired. 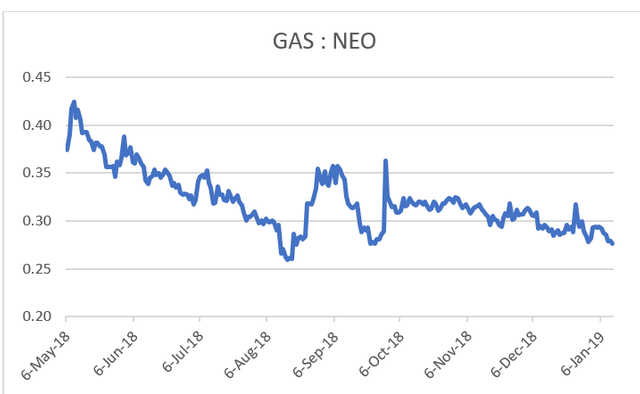 If you look at the below chart, it shows during the last 8 months, how there has been a nice oscillation in the rate of GAS to NEO. There has not been a breakaway and there has not been a steep drop-off. This is because the two tokens move so closely in value, and this is also why you can regularly take advantage of short term price-discrepancy, even during an unexciting market like the current one. This is meant to show you how long term hodlers of NEO may be able to generate greater overall NEO positions, not by compounding with GAS payouts, but by instead using the KuCoin NEO/GAS trading pair to frequently exchange between NEO and GAS. GAS generally rises farther and faster during a bull run, and falls farther and faster during a bear sell-off. You can boost your gains by being in GAS during the run-ups and in NEO during the sell-offs. You can also boost your gains in unexciting markets by taking using multiple limit orders to frequently exchange between NEO and GAS as they fluctuate by even as small as 5% in the short term. If you are a NEO hodler, then KuCoin is a valuable exchange to use as it allows direct trading between NEO and GAS without having to first swap over to BTC or ETH - https://www.kucoin.com/#/?r=P6h2cQ. Even if you don’t plan to trade these cycles, it offers the easiest way to compound your GAS payouts back to NEO, as it is one of the few exchanges to have that direct NEO/GAS trading pair. One other thing to keep in mind with the value of GAS, particularly in bull runs, is that even though price speculation can drive the run, there are still developers that are building upon the NEO platform. These developers still need to buy and spend GAS to deploy their smart contracts, which are even more expensive as NEO does not utilize transaction fees. We have seen similar price increases in ETH gas costs, as well as EOS RAM costs whenever utilization and price speculation overlap. This is another reason why believers in NEO should strongly consider holding GAS instead during bull-runs. Today is a great example of this playing out. In the past 24 hours, GAS has risen by over 50% in value. Anyone holding GAS instead of NEO could now sell their GAS for NEO on KuCoin, and have a greater return than if they had been holding NEO for GAS payout.